I was still up at 2am, trying to get stuff done, when I heard a sort of explosion close to the house. And then it went dark. I was kind of freaked out, so I woke Darren up. After a few minutes, we deduced that, indeed, nobody was trying to break into the house, but the whole street was blacked out. So, Darren reported the outage on his cell phone. 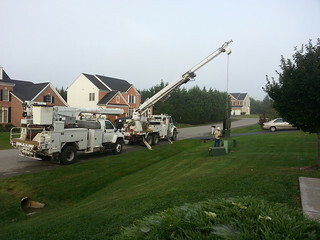 We finally got to sleep around 4am, and luckily, the power company was out by 8am or so, working on things. Luckily, we didn’t lose any food in the fridge, and Darren was to get online and work today. Phew! That was a long day! Now I have no energy, but the only fix for that is to go to bed!